1st Lt Charles J. Holt, Jr. Updated Crew Honor Roll to include Landregan & Tomlinson based on search results of the Social Secuirty Death Index (SSDI). 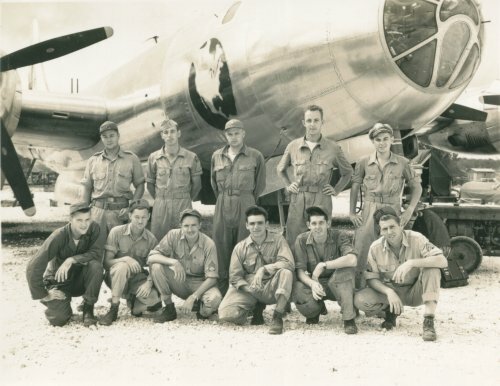 Ron Greer, son of S/Sgt Herbert L. Greer, Radio Operator, provided the names of the crew that we were missing as well as identified the "unknown" crew photo that appreared on the web site as his father's crew. Mrs. Marshall A. Goldston provided a copy of a US One Dollar bill that all of Crew 59 signed for her husband. All of the names above do appear - however we are still unsure of some of their positions on crew. Goldston, Kassel, De Angelis names found on SO-54 dated 5 September 1945 Award of Distinguished Flying Cross along with 3 other members of this crew.